What is a Pulmonary Endarterectomy ? Who is a Candidate for Pulmonary Thromboendarterectomy? How is PTE Performed ? The Pulmonary Thromboendarterectomy Program of We Care partner hospitals in India is recognized worldwide as a pioneer in performing pulmonary thromboendarterectomy, or PTE. This program is foremost in the world in the successful evaluation and treatment of chronic thromboembolic pulmonary hypertension, in addition to performing PTE. Our dynamic team of cardiothoracic surgeons and pulmonologists is acknowledged as the world leader in this field. Patients are referred nationally and internationally to the PTE program, and the number of referrals increases yearly, indicating an increased awareness of the disease and the effectiveness of this procedure. 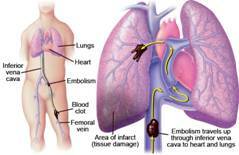 What is Chronic Thromboembolic Pulmonary Hypertension (CTEPH) ? CTEPH is a form of pulmonary hypertension that occurs as the result of blood clots blocking off the arteries of the lungs. Whilst most of these blood clots originate in the veins, many people with this condition may be unaware that these clots are forming. Over time, the blood clots build up in the blood vessels of the lungs which become permanently scarred with narrowing and decreased blood flow finally resulting in increased pressure and resistance to blood flow in the lungs leading to pulmonary hypertension and right heart failure. When severe, this situation leads to increasing breathlessness, limitation in exercise and reduced life expectancy. Acute pulmonary thromboembolic disease : - Blood clots from the legs may travel through the heart and lodge in the branches of the vessels of the lungs. Chronic pulmonary thromboembolic disease : - Some emboli do not dissolve but become 'organized' with fibrous scar tissue, blocking the vessels in the lungs. Pulmonary Endarterectomy (PEA, also known as PTE) is a surgical operation in which the blood vessels of the lungs are cleared of clot and scar material. Although this sounds simple, it is actually technically very difficult to get access to the arteries of the lungs, and the procedure itself is a major undertaking. For this reason it is necessary to ensure that patients who might potentially benefit from this operation are thoroughly evaluated. Not everyone with CTEPH will be suitable for this operation, and a number of additional investigations must be performed in order to assess the appropriateness of surgery and the level of risk involved. However in a large proportion of patients who undergo this operation, their level of activity, quality of life and life expectancy are significantly improved and pulmonary endarterectomy surgery can be thought of as a cure for most patients. Prior to being accepted for surgery, you will have the opportunity to discuss the operation in detail with the surgeon and other members of the team at We Care partner hospitals. Should you or your family have any questions or concerns they will be happy to address them prior to any decisions being made. Who is a Candidate for Pulmonary Thromboendarterectomy (PTE) ? Pulmonary thromboendarterectomy is the definitive treatment for chronic pulmonary hypertension as the result of thromboembolic disease. Although pulmonary embolism (PE) is one of the more common cardiovascular diseases affecting western countries, pulmonary thromboendarteretomy remains an uncommon procedure, mainly because this form of chronic pulmonary hypertension remains an underdiagnosed condition. A typical patient will have a severely elevated pulmonary vascular resistance (PVR) level at rest, the absence of significant comorbid diseases unrelated to right heart failure, and the presence of chronic thrombi on angiography that is consistent with the measured PVR. Our program accepts patients spanning a broad clinical range, from young patients with dyspnea on exertion, to high-risk patients who have vascular disease in segmental and even subsegmental pulmonary arteries, to patients with advanced multi-system organ failure from cardiovascular compromise. Complete the application and medical history information in the Pulmonary Thromboendarterectomy Program package. Have your medical summary sent to the medical team at We Care. This information will be reviewed by one of the PTE team members, who will contact you and your physician with information regarding the arrangements that need to be made. How is PTE Performed in India ? PTE is an eight-hour procedure, performed under general anesthesia, in which the chest is opened and the patient is attached to a heart-lung bypass machine. The patient's body is also cooled to about 68 degrees Fahrenheit, because this temperature reduces the body's need for oxygen by 95 percent. PTE is the surgical procedure to remove life-threatening blood clots-emboli-from pulmonary arteries to restore blood flow to the lungs. The surgery can provide a cure for pulmonary hypertension due to chronic pulmonary thromboembolic disease by restoring normal blood pressure in the pulmonary artery and removing the chance of right-heart failure. 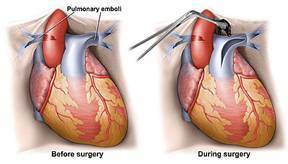 Pulmonary Thromboendarterectomy: Blood clots can be removed directly from the pulmonary arteries by open-heart surgery. Once the patient is attached to the heart-lung bypass pump and the body is cooled, the surgeons open the arteries obstructed by the clots. The doctors then turn off the heart-lung bypass pump to achieve a bloodless surgical field. While no blood is being pumped through the arteries, the doctors carefully extract the clots adhered to the arterial walls. The clots-often more than 10 inches long-are loosened and removed slowly, one by one. The on-off process of the heart-lung bypass pump is repeated until all of the clots are pulled out. Then, the arteries are sewn closed, blood is allowed to flow back through them, the chest is sewn closed, and the surgery is complete.